3-storey and attic ambulance station and headquarters offices on prominent corner site with distinctive red glass and perspex emblematic cross. Previously 2 linked blocks, link now unobtrusively blocked. Squared and snecked bull-faced stone to ground floor, predominantly white tesserae to overhanging other floors. Bays mostly divided by simple concrete columns. Storeys divided by brown glass panels.INTERIOR: plain to Scottish Ambulance Service building with white tiled garage to ground floor. An extremely rare, striking and impressive building by the practice of Skinner, Bailey & Lubetkin. Lubetkin (1901-1990), the celebrated pioneer architect of the Modern Movement in Britain, was principally involved in the design of the dominating cross and geometric staircase. 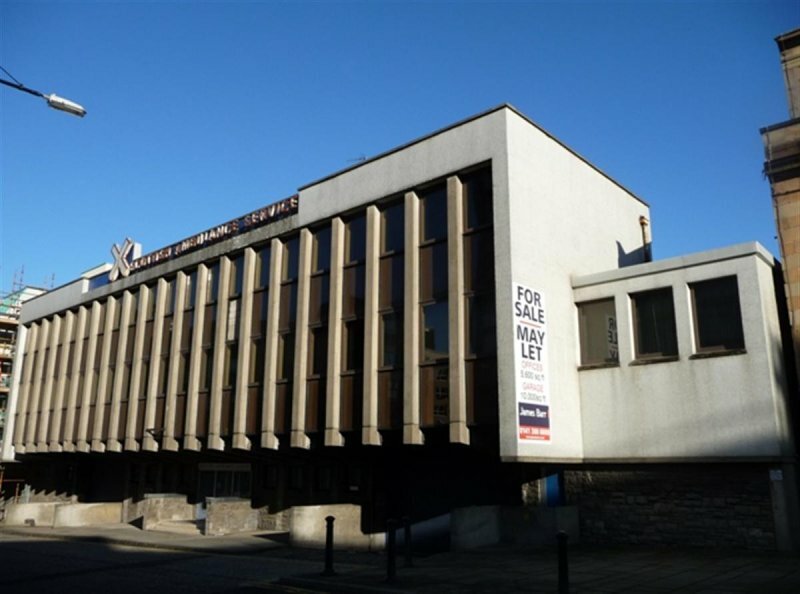 One of only two buildings ever constructed in Scotland by Skinner, Bailey & Lubetkin. The building displays an interesting use of materials, including: tesserae, concrete, stone and coloured glass. Lubetkin founded the radical architectural practice Tecton in the 1930s and it was responsible for some of the decade's most outstanding buildings, including the Penguin Pool at London Zoo and Highpoint flats in London. Tecton was disbanded in 1948 and following work on the proposed New Town of Peterlee, Lubetkin formed the partnership of Skinner, Bailey & Lubetkin in 1950, with Lubetkin nominally acting as 'consultant'. 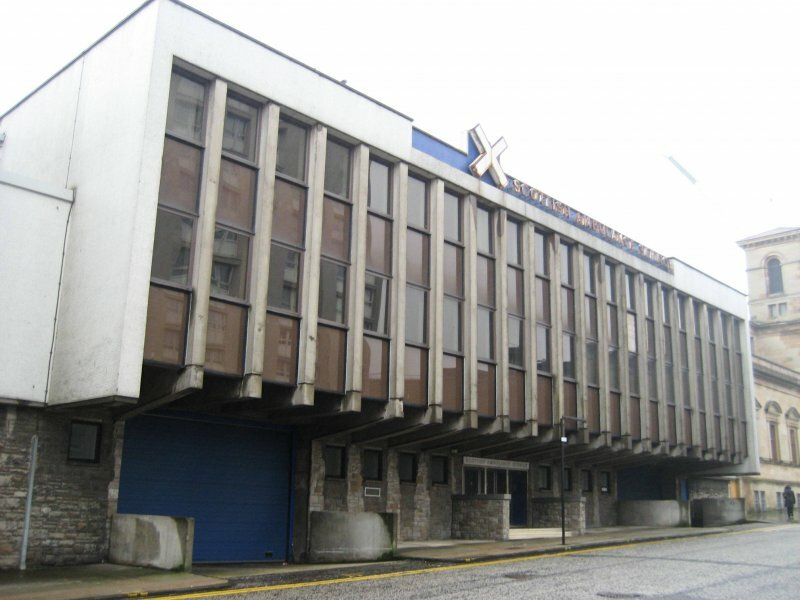 Douglas Bailey (1916-1976), a Scot, was the lead architect for the St Andrew's Ambulance Association building. He trained with the Architectural Association in London, had been Lubetkin's deputy at Peterlee and was aware of Tecton's ambitions. Glasgow Corporation offered the St Andrews Ambulance Association the site at Cowcaddens for the Ambulance Association and the St Andrew's and Red Cross Scottish Ambulance Service. The two services were linked by an integrated lower block although the linking door itself has now been blocked up. While the St Andrew's Ambulance Association continues to occupy its half with the principal façade to Milton Street, the Scottish Ambulance Service who took over statutory provision of ambulances in 1974 now occupies the other half to Maitland Street. 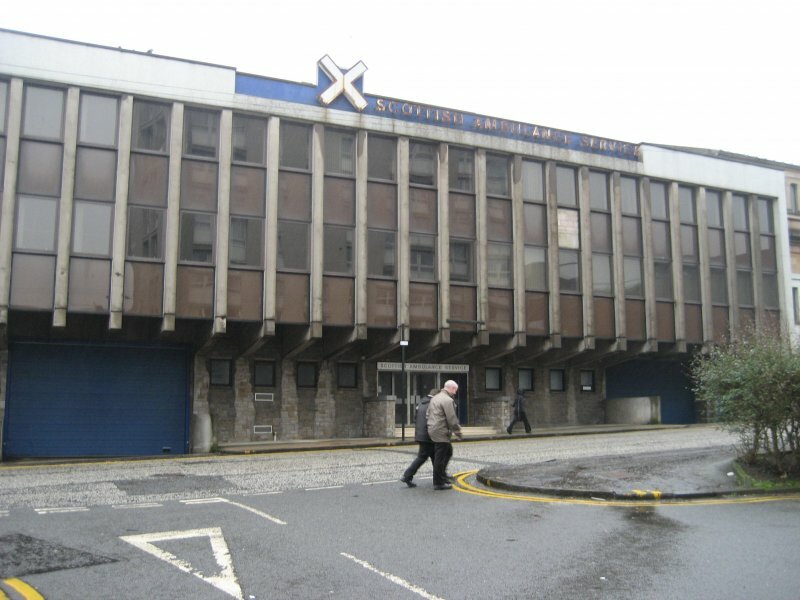 St Andrew's House is not considered At Risk. November 2010: External inspection finds the building disused and secured, other than the rusting "Scottish Ambulance Service" sign it appears, outwardly, to be in good condition. It is currently being marketed for sale/ lease, agent James Barr, notes property is currently under offer. Set to ALERT at this time. February 2011: Glasgow Evening Times reports a £1.1 million upgrade has taken place in the building. Set to NFR. 6 March 2014: A field visit to this site found the Scottish Ambulance Service station remaining vacant. The previous development update on upgrading of the property appears to have applied only to the adjoining St Andrew's House building, which remains in seperate use and is not considered to be At Risk. The Scottish Ambulance Service station is showing signs of deterioration because of its long-term vacancy. An area of cladding has been lost and there is localised damage to the exposed concrete 'ribs'. The signage is becoming increasingly rusted and is subsequently staining areas of the building. Moved to At Risk. 12 August 2014: A consent application (12/02151/DC) was granted in late 2012 for repair and adaptive reuse of the building, prepared by Elder & Cannon Architects.